Are you planning your first trip to Venice, Italy? If so, this three-page introductory guide will make your task easier. The entire city center covers only about 1,800 acres or 725 hectares, which is a little more than twice the size of New York's Central Park or London's Hampstead Heath. In the satellite map above, the centro storico or historic center of Venice is connected to the mainland suburb of Mestre by the Ponte della Libertà, a long causeway that was built early in the 19th Century. The causeway carries road traffic to Venice's Piazzale Roma and the parking island of Tronchetto. Train tracks run alongside the roadway and end at the Venezia Santa Lucia railroad station, which is visible as a grey spot where the road curves toward Tronchetto. 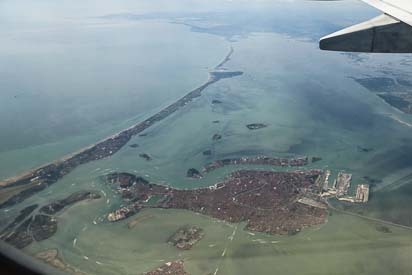 If you zoom out by pressing the "-" button twice, you'll see Venice Marco Polo Airport near the top of the photo, about 6 km or 4 miles from the city center. Important islands near the historic center are La Giudecca (separated from the centro storico by the Giudecca Canal, which is used by cruise ships), San Michele (Venice's island cemetery), and the glassmaking island of Murano. To the right or east of the historic center is the Lido di Venezia, a long, narrow strip of land that separates the Venetian Lagoon (which surrounds Venice) from the Adriatic Sea. Cruise ships and ferries enter and exit the lagoon via the Porto di Lido, a gap between the Lido and the suburb of Punta Sabbioni.